So, last week Joy The Baker opened up a contest of sorts on her blog wherein she partnered with King Arthur Flour. There will be four baking challenges and that’s pretty exciting. Winning or not winning, I am not that concerned with it. Is it cheesy to say “we’re all winners”? It might be. I’m leaving it. 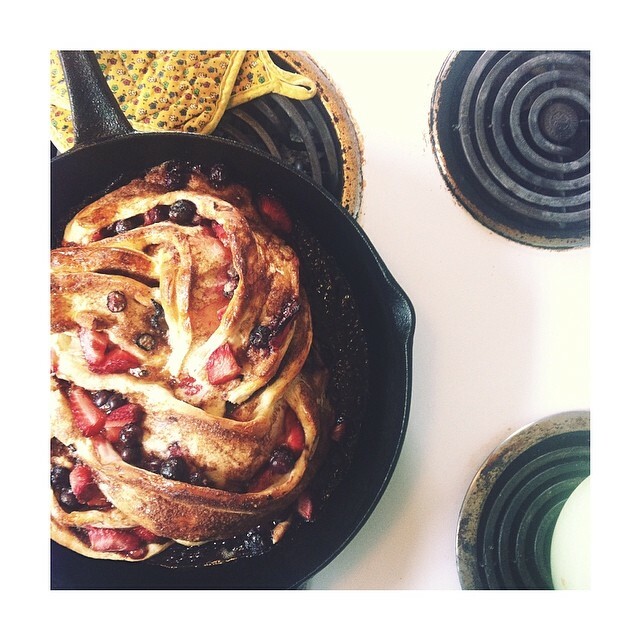 Anyway, for the very first session, we were challenged to make this Triple Berry Cinnamon Swirl Bread (there’s a recipe on that link). And I did it. And I loved it so much. I love to cook. You all know this. I feel like I’m okay at throwing together a dinner (though my current rut is driving me bananas) together but baking I struggle with. I am not a perfectionist at all and baking is as much science as it is delicious so we don’t always get along. But I want to get better at it! I want to stretch myself and develop more skills. That’s why I agreed to this challenge. Because we all need a bit of a challenge every now and again. So I made this bread and sure, it was delicious. That was a given. I mean, Joy The Baker is the developer of utterly flawless recipes. But what I liked the most was the sense of accomplishment that I felt when it all came together. It’s not easy! I needed Ryan’s help in a spot or two. I broke a dish at one point (sorry, favorite coffee mug). It wasn’t easy and it wasn’t the kind of thing that I would have ever made on my own (it’s hard to talk yourself into doing a project like this when it’s just you and your boyfriend in the house). But it felt so good. And then it felt good to bring it to a friend’s house later that night where we broke this bread, together. Here’s to accepting our challenges.